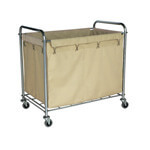 Simply toss your soiled linens into this Luxor HL13 laundry cart for quick clean up. For added convenience, its solid blue frame folds for easy storage when not in use. Four 3" casters allow for slick maneuvering around corners. 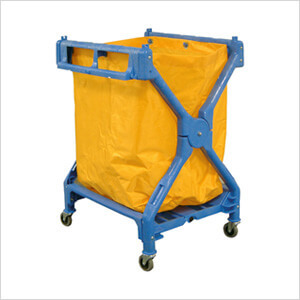 This laundry cart is perfect for your banquet facility, hotel, or fine dining restaurant. Comes complete with an orange nylon laundry bag. Assembly required.